Share the post "Album review: RED BAZAR – Things As They Appear"
Whilst much of music these days drifts aimlessly in a reality-TV-induced slough of mediocrity, progressive rock appears to be in rude health – bucking the trend with a slew of tremendous albums released already this year. 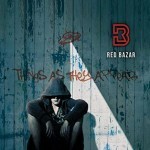 Add to this list Red Bazar’s ‘Things As They Appear’ – the Nottingham band’s exceptional follow-up to ‘Tales From The Bookcase’ which was runner-up in the Classic Rock Society’s ‘Album Of 2016’. Originally founded as an instrumental prog band in 2007 (an explanation, perhaps, for the quality of musicianship on display here) the band took a big leap forward in 2013 when they were joined by keyboard player Gary Marsh and, in particular, Peter Jones on vocals and keyboards. As most prog aficionados will know, Peter Jones is the multi-instrumentalist behind Tiger Moth Tales and, as anyone who saw their latest tour will testify, now a significant other in Camel’s recent renaissance. He’s also part of the reason that ‘Things As They Appear’ is so good – but only a part. The whole band are exceptional musicians; Andy Wilson (guitar), Mick Wilson (bass) and Paul Comerie (drums) display all the skill and cohesion that playing together for over a decade inevitably brings - and the whole album has been superbly recorded and produced by the band themselves. From the crashing chords that introduce opener ‘Temple’, the eight tracks are an object lesson in contemporary progressive rock – a template much used in days of yore but given a 21st Century sheen that, at times, is breathtaking. There’s ‘wow’ moments galore here on an album that explores the modern world and all its foibles. Much of it is very dark, as you’d expect, but there’s also an uplifting quality about the whole thing that is hard to quantify. High points must include the scintillating guitar work on ‘Temple’, ‘Liar’, Rocky Bone Runway’ and ‘Future Song’, Jones’ keyboard solo on ‘Nothing Left’ and the bass and drums throughout that hold the entire edifice together. Peter Jones’ vocals are just the ticket – people have compared his voice to Peter Gabriel and you can sort of see why, but I would point you in the direction of IQ’s Peter Nicholls as a true comparison – either way, they are just perfect for the material. I would hold up ‘Spiral’ as the go-to track where everything that is great about this album coalesces to stunning effect and ‘The Parting’ which is a great amalgam of all our prog favourites – Yes, Genesis, King Crimson and even a little Wishbone Ash. In all, ‘Things As They Appear’ is probably as good as contemporary progressive rock gets – there’s guitar a-plenty, there’s soaring keyboards, the drums are well up in the mix (always a good thing) and there’s an intelligent and relevant libretto delivered with passion. This entry was posted in ALBUM REVIEWS, ALBUM REVIEWS (Mobile) and tagged Camel, Peter Jones, Progressive Rock, Red Bazar, review, Things As They Appear, Tiger Moth Tales. Bookmark the permalink.